A group of volunteers are being encouraged to gain new skills and work towards a level 2 qualification in Work Based Environmental Conservation, accredited by City & Guilds. There are currently 10 volunteers aged from 16 to 20 who attend 3 days a week, working on various tasks on the Caldon Canal. CUCT have an exhibition at Cheadle Discovery Centre from today until 28th March 2015. As well as an extensive display about the Uttoxeter Canal, there are a range of other displays on canal-related themes. Two films about the Caldon Canal in the 1970s can be viewed. Leaflets about various activities are available to take away along with a guide book about the Caldon Canal, which is available to purchase. We have been advised by Canal & River Trust of a towpath closure on the Caldon Canal at bridge 50A from Thursday 4 December 2014 until further notice. Information about the Caldon 40 celebrations, marking the anniversary of the reopening of the canal in 1974, is now online. 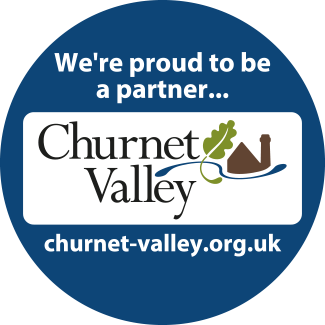 CUCT in partnership with Inland Waterways Association and the Churnet Valley Living Landscape Partnership will be hosting a series of events over the weekend 26-28th September 2014. Volunteers from the Waterway Recovery Group have spent a week working with the Trust to reinstate the towpath of the Uttoxeter Canal near to Bridge 70 at Crumpwood. They also repointed the bridge sides and cleared some fallen stones from the canal bed, as well as clearing a large area of Himalayan Balsam from the area. Please note laundry facilities are no longer available at this location, the next laundry facilities are at Red Bull Services on the Trent & Mersey Canal. Alternatively laundrettes can be found in Leek, Stone and Stoke. We have been advised by Canal & River Trust of a short stoppage on the Caldon Canal at Lock 11 (Hazelhurst Middle Lock) between 5pm and 10pm on Tuesday 29 July 2014. Come and join in our monthly work parties, carrying out useful tasks on the Caldon Canal. Work includes vegetation clearance, painting, hedge planting and other tasks. All tools and equipment are provided. Volunteers are advised to wear old clothes, stout shoes and to bring waterproofs and a packed lunch.